ABSTRACT Macquarie Island consists of uplifted oceanic crust, uniquely situated in the ocean basin where it formed, thus allowing onshore structures to be placed into their regional oceanic tectonic context. The Finch-Langdon fault, the most significant spreading-related structure on the island, juxtaposes upper-crust rocks against lowercrust and upper-mantle rocks. 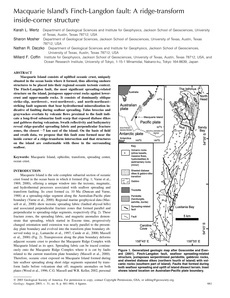 It consists of dominantly oblique strike-slip, northwest-, west-northwest–, and north-northeast–striking fault segments that bear hydrothermal mineralization indicative of faulting during seafloor spreading. Talus breccias and graywackes overlain by volcanic flows proximal to the fault indicate a long-lived submarine fault scarp that exposed diabase dikes and gabbros during volcanism. Swath reflectivity and bathymetry reveal ridge-parallel spreading fabric and perpendicular fracture zones, the closest ;7 km east of the island. On the basis of field and swath data, we propose that this fault zone formed near the inside corner of a ridge-transform intersection and that structures on the island are conformablconformable with those in the surrounding seafloor.